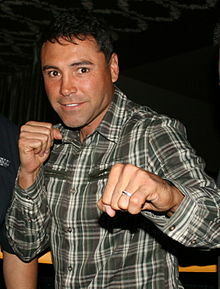 Oscar de la Hoya (born February 4, 1973), also known as the "Golden Boy", is a former boxer. He is Mexican-American. He won a gold medal for the United States at the 1992 Summer Olympics. ↑ "Oscar De La Hoya". BoxRec. This page was last changed on 6 June 2013, at 22:10.